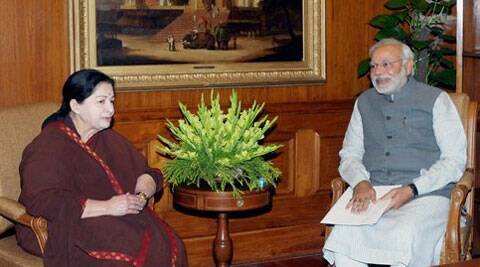 Jaya urged PM Narendra Modi to secure the release of 46 fishermen immediately release along with 11 detained boats. Slamming Sri Lanka for arresting 46 fishermen from her state on Wednesday as a “belligerent act” Tamil Nadu Chief Minister J Jayalalithaa on Thursday urged Prime Minister Narendra Modi to secure their immediate release along with 11 detained boats. “It deeply pains me to have to write to you yet again, bringing to your notice two separate incidents in which 46 Indian fishermen along with 11 boats from Tamil Nadu have been apprehended by the Sri Lankan Navy”, she noted in her fresh missive to Modi. Twenty four fishermen in six mechanised boats from Kottaipattinam were nabbed on Wednesday and in another incident 22 of them from Rameswaram were also taken into custody taking the total arrest to 46. Jayalalithaa renewed her plea for nullifying what she described as “unconstitutional” Indo-Sri Lankan Agreements of 1974 and 1976 and demanded that steps be taken to restore the traditional rights of Indian fishermen. She also reiterated her oft repeated demand for retrieval of Katchatheevu islet ceded to Sri Lanka to protect the fishing rights of Tamil Nadu fishermen. Jayalalithaa recalled that following the Prime Minister’s intervention earlier fishermen arrested from Tamil Nadu were released by Sri Lankan authorities. However, their boats and fishing gear were confiscated and Jayalalithaa demanded their release immediately. She also reiterated that the Centre should not treat the International Maritime Boundary Line with Sri Lanka as a settled question as the constitutionality of the 1974 and 1976 agreements has already been challenged by her state in the Supreme Court.